Hi everyone, I decided to jump into the wonderful world of IOT and decided to do a simple project to start : a Weather Station, and at a starting point : a Temperature and humidity sensor (using DHT22). It does connect to the WIFI but it seems pretty much it, nothing else is happening. I am honestly loosing my mind I check 25 times the connections. I tried different RFM69 Modules. I triple check the code, Tried to read about everything I can find but I cannot figure out what is wrong. Sorry I forgot to mention : I am using the version 2.0 of Mysensors, I use Arduino IDE 1.6.13. 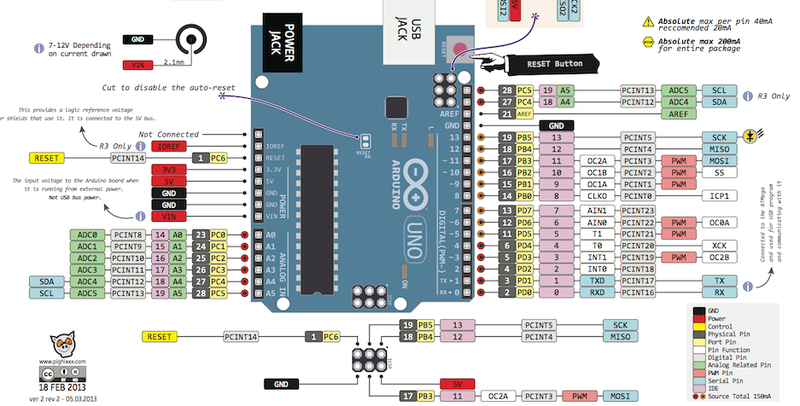 Uno is 5V powered and RFM69 inputs are not 5V compliant. Perhaps your radio is dead. You powered your radio with 3.3V but UNO outputs are 5V (except some specials boards like iteaduino). I fried 1 radio with this mistale ! I just double check the output from the 3.3V pinout to be sure and I get 3.28V. Just to say, I was getting the exact same result with a standalone power supply @3.3V. @Fabien understand your point and I may have fried it with the UNO, but I doubt it is the cause as I had exactly the same output with my first build with a Pro mini 3.3v, every pin were 3.3V and the debug looked exactly the same. I tried with the UNO after countless attempts with 3.3V boards. But taking your point I will try again with a different radio module and a 3.3V. I have exactly the same setup on gateway, working fine. @Fabien I tried yesterday but it doesn't seem to work. I will try again tonight as I did the test in a rush and may have overseen something. I just thought about something, could it be possible that the RFM69 doesn't get enough power ? I will try with a separate power source tonight to rule out this. @christophe-cluzel Yes, I got the same problem, I have been 3days to find out the solution, but no result. I configure the RFM69 with ESP8266 as a gateway and Promini as a node. The pin connections same with yours. Put the RFM69 in a separate power source, added a 100uF capacitor for the radio. how do I know that the Arduino or the ESP is communicating or seeing the RFM module ? Using NRF24, actually, mysensors system is no problem. The node (ATMEGA328) and the gateway (ESP8266) can work properly. Now we have 3 nodes and one gateway, working properly. We use MyController.org software deployed in cloud server as the controller. We want to work on RFM69, because the radio can use 433MHz, while NRF24 use 2.4GHz. This is the crowded frequency. @maman I agree, but I am trying to get my project starting to be fair I do not live in a Mansion and my further sensor will be the one in the Garden for the weather station and the Watering system. So maybe the NRF24L01+ will be ok. I will keep working in parallel on the RFM69, but right now I feel that I am just wasting time and getting nothing achieved. hmm..something is wrong with your hardware or settings, with pro mini or esp it should work..
What frequency do you want to use? and maybe a dumb question, but in case.. have you soldered an antenna on your rfm69 modules? @maman Switching to NRF24 worked like a charm first time. node and gateway are communicating and everything is visible in Domoticz. @christophe-cluzel Good luck. Using NRF24 & mysensors library, make IoT project is easy to be implemented. Thanks for mysensors team that have been developed this great library. In the previous project, we have tested the range of NRF24. In the open-space, the 100m range can be easily achieved. If it is not enough, there are many modules of NRF24+PA+LNA that can have range for more than 1km. My concern is the use of frequency at crowded 2.4GHz. In my previous work, I installed my NRF24-based lamp controllers in an exhibition. In that place, the commitee provided a free wifi services. Before opening of the exhibition, we have tested the lamps controllers and working properly. However, during exhibition, the controller was not working. I suspected that this was due to no available channel at 2.4GHz band at that exhibition place. So, if there an option, I want to avoid the use of 2.4GHz band. So, I still hope to use RFM69. May be someone have used this RFM69 module, and can share the pin connections and #define configuration in the arduino sketch. @christophe-cluzel have you had a chance to get the rfm69 modules to work? I also have a problem with rfm69. NRF24 always works. RFM69 can operate for hours and then disconnect and can not connect to the gateway for a long time.